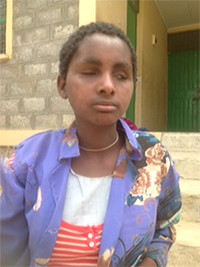 Meseret is a quiet girl of 13 who has been at the School for 3 years. Her full name is Meseret Agadi Berhe. Sadly she doesn’t know that she is in fact an orphan. Since she has been here, her mother has died and the man she thinks is her father is actually her uncle. She hopes to return to her family and often asks the staff when she can go. 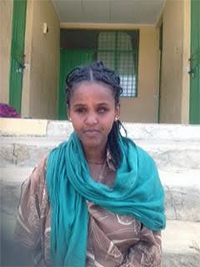 She was brought to the school when her farming family including 3 sisters and a brother, moved 1000 kilometers south to an area of Ethiopia where there is more fertile land. Apparently this was a project which many farmers from this region responded to though not always successfully as they speak a different language from the locals there and were often treated as outsiders. However, Meseret’s family has settled and will stay. But Meseret’s return is unlikely. She went blind aged 3 as a result of smallpox. Recently the staff realised she had TB which it seems she contracted from her parents. She has been treated over several months and is well at the moment. Like so many others here, she had had no education before she came to the school and is now at Grade 2. But she likes Science best followed by English and listens to music on the radio. Her dream of the future is to be a doctor. 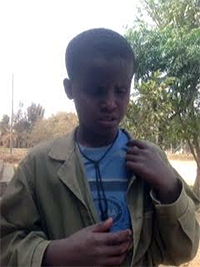 This shy boy is 10 years old and has only been at Mekelle Blind School for a year. His name is Gicherkos, full name Gicherkos Brhane Tihaimanat. He comes from a village about 150 kilometers from the town. He was born blind to parents who were both deaf, so that when he came to the school he had little experience of language. Concerned neighbors brought him to the school so that he would get some education. He still struggles to speak but the Director says he is making progress. He hides his eyes from the light and touch is even more important to him than to other blind children as it was the family method of communication. There are 2 sighted brothers back in the village where it is likely he will return eventually. The Director says he settled into to school fairly quickly and is as mad about football as most of the boys. They can listen to matches on a radio in their dormitories or on the one TV on site. Gicherkos is a keen Arsenal supporter. When asked what he would like to be in life, he hesitates for some time and mumbles, doctor. This poised 17 year old with carefully plaited hair and pretty earrings will have to leave the Blind School when she has finished the next grade of class. To continue her education as she wishes, she will have to live in a hostel near a mainstream school. There will be a small fund for her rent and expenses but life will be very difficult for her as all the girls are vulnerable, especially so if they have no family or other support. Culturally it is more difficult for them to learn independence, go into public places, eat in cafés and so on, than it is for the boys. The funds supplied are very limited too. A gifted girl like Tesenbet with all her hopes for the future will hopefully benefit from some of the projects we are planning for the future. We have to wish her luck. 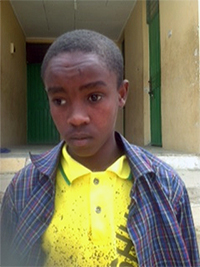 This serious smart 16 year old is Habatamu, full name Habtamu Mesele Redac. He tells me he is an orphan but also that he has a stepmother and 4 brothers. He was brought to the school 6 years ago and is doing well. He quickly learnt Tigrayan as the village of Machew, where he came from, is an Amharic speaking area. He also speaks good English and is confident in conversation. An aunt took him first to Addis Abbaba to the German Church school there which has a good reputation and where the curriculum is in Amharic but he didn’t get a place. So he came to Mekelle, very keen to get an education where he could. He is another enthusiastic football player, out on the expanse of the compound with their ball with a bell inside early every morning. But this day, a public holiday, he is using the time to study. He will listen to the radio in his break and is sure Manchester United is the best team. Geography and English are his best subjects and his plan is to be a Geography teacher.